Dirty dishes, meet your match. Today's dishwashers can handle the toughest grease and grime while using less water and energy than ever before. Whether you're finally moving up from hand-washing or are itching to upgrade, your dishwasher search starts now. When you’re planning a dinner party, it’s not long before you start picturing the pile of plates that will await you once your guests depart. Hand-washing your way through pots, mixing bowls, and place settings would take you—approximately—ages. At the prospect of all that drudgery, you might find yourself reconsidering the party. But before you call off your get-together, consider investing in a dishwasher. Having a machine to clean your dishes could save you an estimated 230 hours—that’s nearly 10 days!—per year. Even if you already own a dishwasher, you too have a lot to gain by purchasing a new model. Today’s dishwashers use at least 40 percent less water than similar appliances manufactured 20 years ago. Besides conservation, there’s a compelling financial reason to upgrade: An Energy Star-rated dishwasher could save you more than $40 per year. The question really isn’t why should you buy a dishwasher; it’s why shouldn’t you? On the market today are a generous variety of options, ranging from plain-Jane models with few frills to pricier, fully programmable “smart” models that do everything but load and unload automatically. Not certain where your needs fall in the spectrum? We’ve laid out a handful of key considerations to keep in mind. Size and capacity. Dishwashers normally come in two sizes. The standard dimensions are 24 inches wide by 34 inches tall (34 inches being the height of most countertops and base cabinetry). Compact models are 18 inches wide. A compact washer is usually fitted with one or two racks, while a standard size holds two or three, enough to accommodate at least eight place settings. In any case, adjustable upper racks and removable baskets earn bonus points, as either feature goes a long way toward accommodating awkwardly shaped items. Dishwashers in custom sizes are available by special order, but be prepared to pay more. Cycle selections. The number and variety of cycle selections will vary from washer to washer, and finding the best selection of cycles for your needs will often be the deciding factor in your purchase. A typical washer will come with settings for a “normal” wash cycle, which can run anywhere from 90 to 135 minutes, depending on the make and model of the machine; a“heavy” cycle for pots and pans; and perhaps a “light” (also known as “delicate”) cycle for stemware. Pricier models offer additional options, including a “rinse and hold” cycle; a cycle for china; and a heavy-duty sanitizing cycle. Some dishwashers also offer different drying cycles, and some feature a programmable delayed start option. Water usage. Today’s dishwashers are required by law to use a maximum of 5.8 gallons of water per cycle. 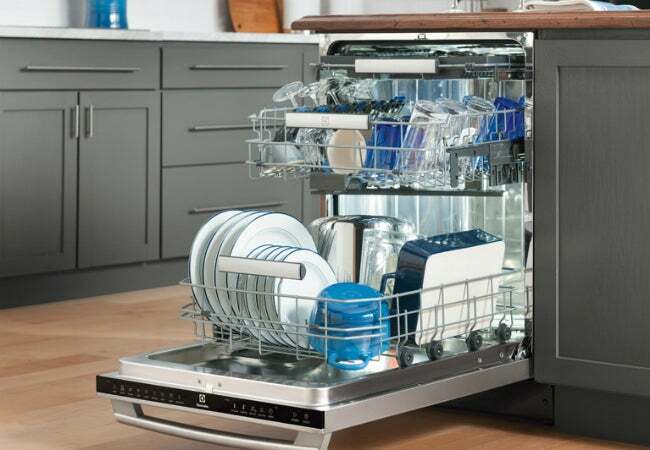 Some upscale dishwashers even include an “eco” cycle that utilizes less water than a regular cycle, while others are equipped with a sensor that determines how dirty the dishes are and adjusts the water usage and cycle automatically. Energy efficiency. Models on the market today are required by law to carry an Energy Guide label that estimates how much power the appliance consumes per year as well as the estimated cost of running the appliance based on the national average cost of natural gas and electricity. Look for the Energy Star logo, which indicates that the unit exceeds the federal minimum standards for efficiency and quality. Other bells and whistles. Popular extras available in today’s dishwashers include innovative spray arms to move wash water more efficiently, stemware clips to secure wine glasses, spray nozzles for cleaning bottles and jars, special cutlery racks, programmable controls, and child locks. A variety of exterior options can complement the look of your kitchen (or a pending remodel), including ever-popular stainless steel, mirrored finishes, or a variety of colored finishes, and some dishwashers can even be outfitted with insert panels to match and blend in with cabinetry. This 24-inch-wide unit garnered 4.3 out of 5 stars on Amazon. It boasts a 16-place-setting capacity and features a third rack for smaller items that fits up to 30 percent more in each load. This model offers five cycles and five additional wash options, including Sanitize to wipe out bacteria and ExtraShine to dry glasses—no need to follow up with a microfiber cloth for a spot-free shine. 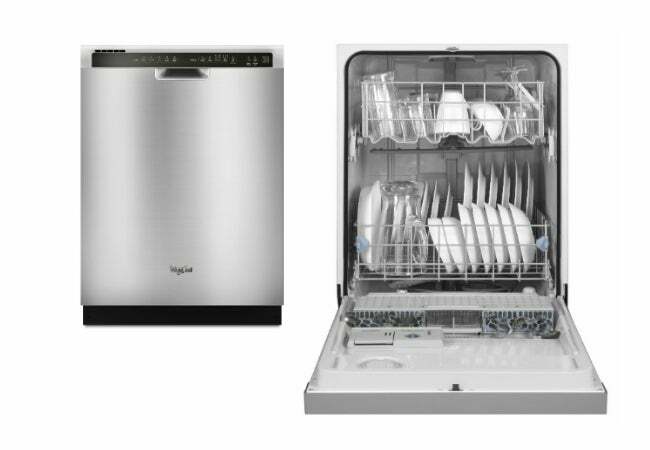 Meanwhile, its 44-decibel sound rating led reviewers to praise this model as “the quietest dishwasher ever.” Price: $899. 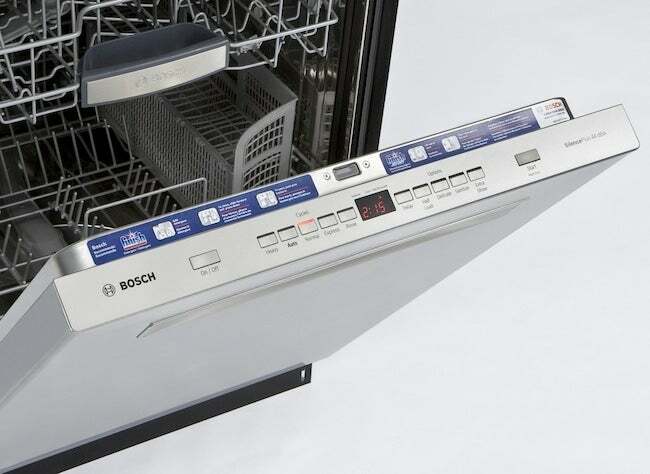 Rated the best dishwasher of 2014 by Reviewed.com, this 24-inch-wide washer’s structure makes loading super simple. It boasts three easy-lift racks, nine stemware grips to secure glasses, and a cutlery basket that can split into two for flexible positioning wherever you find space. We think this model’s wealth of high-tech features makes up for the higher price tag. Among its slick offerings are a circular spray arm for more cleaning coverage, a smart soil sensor, a “clean” light to indicate when the load ends (because it’s that quiet), and a touch-sensitive control panel. Plus, its Fast Wash—one of nine cycles total—cleans a load in 30 minutes, perfect for those nights when you’re short on time. Price: $1,099. A favorite of Home Depot shoppers, who gave it 4.4 stars and a recommendation rate of 92 percent, this 24-inch-wide unit is both smart and budget-friendly. Its Sensor Cycle intuitively selects the best wash and dry settings for a specific load, saving time and money. Other cycles (there are a total of six) range from the typical normal to an overnight cycle that can tackle the toughest of sticky situations. This unit loads up to 15 place settings comfortably in its tall tub design due to features like a movable AnyWare Plus silverware basket; an adjustable (even removable) top rack; and a large-capacity lower rack that easily accommodates plates, bowls, and large dishes. Price: $549.